The internet and international travel have shown us that people have a wide range of different beliefs and practices, and there is no longer an accepted 'right way' to live. It can seem like anyone waving a placard about abortion, or making a stand either for or against gay marriage is really just telling us about their own, personal opinions. They aren't talking about facts, as there is no objective right or wrong way to act. This sort of non-cognitivist position, that claims there is no right answer when it comes to ethics, can lead to emotivism. As you will learn when looking at Religious Language, the Vienna Circle wanted to do just that, pruning the tree of knowledge to get rid of the dead wood. Not only was any talk of God meaningless, but moral language was also unverifiable and therefore meaningless. Analytic truths are true by denition, like mathematics or statements of the sort 'All bachelors are unmarried'. The truth is known immediately, when we understand what bachelor means. Synthetic truths are verified by experience. They may or may not be true, and we look to find out. They include truths like 'The sun is shining' and statements like 'Nothing can escape a black hole'. Note that these statements are synthetic, even though they may not actually be true. A bit of investigation will show that the sun is shining day and night, even if we can't see it, and black holes emit Hawking radiation (thank you, and RIP). Moral statements, such as 'it's wrong to illegally download music' and 'animal experimentation is evil', don't fall into either category. So what is happening when I say 'We shouldn't experiment on primates'? This means 'Boo to experiments' is a useless statement. It would be better if I said 'I feel that animal experiments are wrong', because at least that's a proposition. We could then discuss whether I actually do feel that all animal experiments are wrong, or whether my feelings are limited to certain experiments. Ayer says moral statements aren't even factual propositions about what I feel, they are just outbursts of emotion with no meaning in them at all. People make ethical statements to express feelings, to arouse feelings in others and to cause people to act a certain way. We cannot debate about ethical statements, because they are not meaningful propositions about the world. In April 2018, the BBC broadcast Hans Rosling talking about 'Factfulness'. Professor Rosling has made it something of a life goal to see past all of the emotional cloud surrounding important issues about government funding, medicines, vaccines etc. He wants people to debate important issues like abortion, world poverty and so on. However, like Ayer, he thinks that when people invoke ethics, they let values cloud their judgment. Rather than talk about whether ten children in Africa are worth more or less than five children in the UK, we should find out which forms of aid save the most lives. Let's limit debate to matters of fact, and then we can each act in an informed, rational way. So, the main strength of emotivism is that it wants to move us away from pointless emotional outbursts that get us nowhere, and make us focus on facts. Why is it such an appallingly bad theory, then? Ayer is wrong about ethical statements. I think it is morally right to pay for the films I watch, but I really don't feel strongly about it. Not all ethical statements are emotional. CS Stevenson developed the theory to talk about opinions, which is better. When I say "You should pay for your downloads," I am expressing an opinion. However, there is more to it than that. Prescriptivists like RM Hare say I am actually making a universal prescription. Read MacIntyre's critique (link on the right) - he points out that we have emotional reactions to a number of things, but moral outrage is different. If I saw Jimmy Carr live and his jokes weren't funny, then I heard he didn't pay his taxes, I would actually feel more upset about the unfunny jokes. However, when I say he should pay his taxes, I am setting up some expectations. I am commiting to the idea that I should pay taxes, and I am prescribing this to everyone else as well. Prescriptivists aren't cognitivists - they don't believe there is an objective truth to morality. However, they do a much better job of explaining what is going on when I make moral statements. There is a summary set of notes from the exam board. Print it out and highlight key points. Have a go at the sample exam questions. Look at the outline mark sheets for (a) and (b). Check whether you have given examples, quotes from scholars etc. to get your target level. (b) Are moral terms just expressions of emotion? 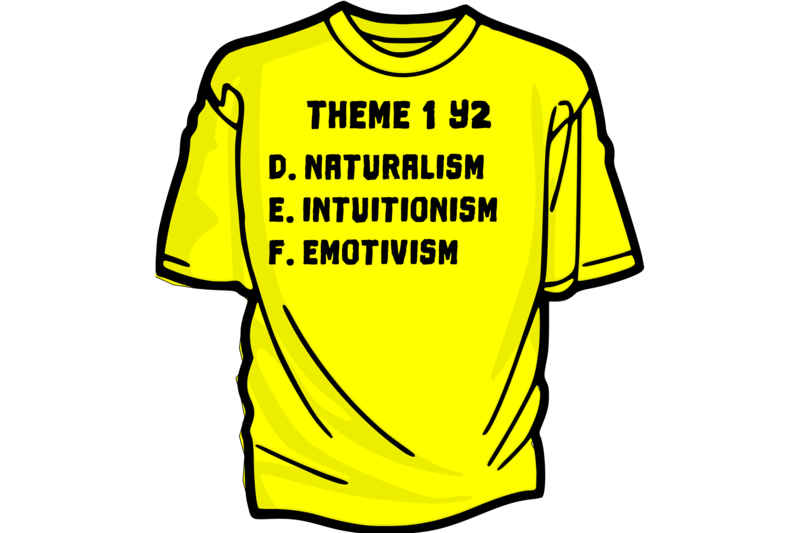 Emotivists criticise Naturalism because it claims moral truths are objective. Despite the naturalistic fallacy, lots of people believe that we can agree on basic moral truths. The Universal Declaration of Human Rights has been widely accepted, which supports cognitivist ethical positions. Intuitionists agree with Naturalists that there are objective moral truths. They are ethical cognitivists. However, they don't think we can demonstrate moral truths, we just know them like we recognise colours. You should appreciate the strengths and weaknesses of both theories for when you evaluate Emotivism.